Mega Sale! Save 26% on the 1 Ton Push Beam Trolley Adjustable for I-beam flange width: 2-11/16'' to 5-1/8'' by Harbor Freight Tools at N Online Agency. SKU: 97392. Hurry! Limited time offer. Offer valid only while supplies last. Manage heavy loads using straight or curved I-beam track. Excellent for industrial use, warehouse, garage and maintenance. Weight capacity:2000 lbs. Manage heavy loads using straight or curved I-beam track. Excellent for industrial use, warehouse, garage and maintenance. Weight capacity:2000 lbs. 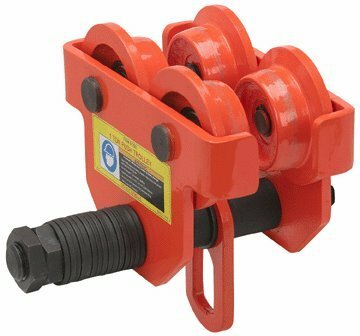 Minimum curved track radius: 3 ft. 3" I-beam flange width:2-11/16" to 5-1/8" Wheel dimensions: 2-3/4" diameter with 3/8" wall Trolley dimensions: 8-7/8" L x 4-7/8" W x 6-3/8" H Weight: 21.10 lbs. If you have any questions about this product by Harbor Freight Tools, contact us by completing and submitting the form below. If you are looking for a specif part number, please include it with your message.